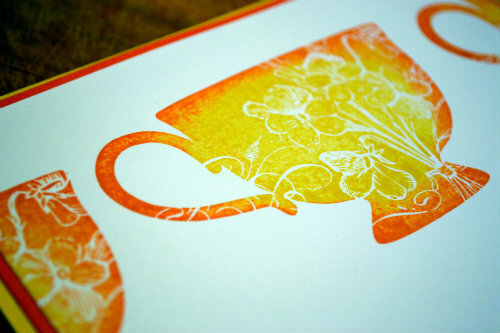 It's time for a another quick and easy card to help ease you into your crafting week. Inspired by last weeks #techniquethursday I've created another card using the simple rock and roll technique. You can make this card in no time at all. 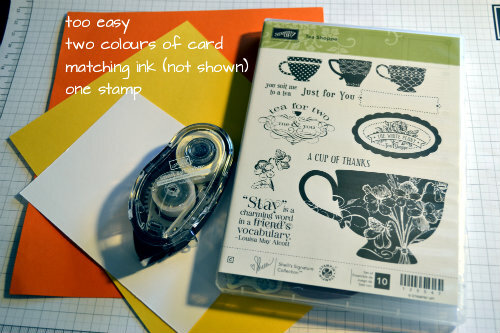 Here's what I used - card, ink and 2 stamps... and of course glue. I picked a large stamp to cover as much of the card as possible. I wanted to do something bright which is a little outside my comfort zone so I chose the colours Daffodil Delight and Pumpkin Pie. They go really well together in the rock and roll technique. I stamped the first image centrally on the card to create a focal point, and then repeated the process to stamp partial images off the card each side. Remember it's important place the card over a larger piece of scrap paper when stamping off the edges so you don't end up with ink on the table or on your craft mat. A simple sentiment and some layering and it's all done. I had to try and take a close up photo of the stamped image for you so you can see how awesome this stamp is. 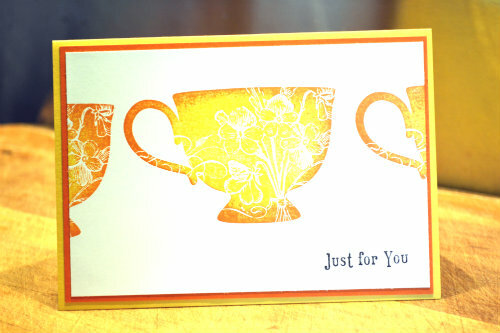 Not only is it a lovely tea cup shape but the etching of flowers in it is beautifully done. Now you could finish there - it's really complete as it is. But as I had a spare few minutes I added some crystal effects to my teacups to give them this wonderful glossy feel. It looks great in real life, however taking a photo was a little tricky. I hope you can get the idea. If you do use crystal effects on a card you need to allow significant time for it to dry after, so if you're making a card to give in a hurry (like I sometimes do 5 minutes before leaving for a party) it's probably best to leave it off.